This is an extended discussion of the question that appeared in the Viewpoints department of the May/June 2014 issue of Dimensions magazine. Making and tinkering are not fads. Their presence in science centers and museums may be a fad for many, but “making” is a human biological imperative. We are the species that makes over its environment to suit our needs more than any other. In many ways, a great number of us have become consumers rather than creators. Encouraging making and sharing useful skills seem like perfect jobs for informal education institutions. Making and tinkering spaces in museums should be fluid, they should change, they should grow and contract, they should be “made” and made again. At the very least, making should fit your mission and you should define what a making or tinkering space is within your institutional culture. Certainly, great learning can happen as part of the Maker movement in a studio arts or traditional shop experience. While the “Maker” name is relatively new, the do-it-yourself spirit and purposeful creating to solve a problem have been around for some time. At the Museum of Science, Boston, we call this engineering and foster it through authentic experiences where families can design, build, and test prototype solutions in a context similar to what real engineers face. Instead of being simply a fad or a trend, we must ask ourselves: What do science and technology centers bring to the Maker movement? Our strengths are providing multigenerational collaborative educational programs with elements of the Maker movement, while keeping the focus firmly on the science and technology our audiences expect and our missions demand. 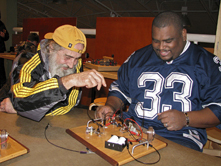 These activities give visitors an accessible entry point to the deeper “Maker” world of arts, engineering, and programming. People have always been interested in tinkering, especially kids. Just look at Legos, Erector sets, and dozens of other build-it-at-home kits. Technology today is becoming increasingly difficult to tinker with (consider some of the new cars and computers that require expertise and specific, expensive equipment to fix). However, new technologies today are enabling more and new types of making. Consider 3D printers, for instance, or the growth of homemade robotics. To me, tinkering and making in museums isn’t about whether the public is interested; as long as novel and interesting options are available, I suspect the interest from the public will be there. The real question is whether museums desire to, or can afford to, provide such services. Personally, I think it engages and educates more than most science museum exhibits (which may get as little as 30 seconds of attention). Are they here to stay? I hope so. They’re definitely not a fad. They’re also not the new, revolutionary concepts that some might suspect. I remember educators using the term “make and take” in the ’90s (and the Maker movement was a part of Neal Stephenson’s book The Diamond Age, published in 1995). There was a time when the hot topic that was surging in science centers was hands-on, interactive exhibits. And web-based stuff. And inquiry-based learning. And STEM (science, technology, engineering, and math), which is now morphing into STEAM (science, technology, engineering, art, and math) in some quarters. Those may not be the cause célèbre they once were, but all are still very much in use in our exhibits and programming. I have no doubt that making and tinkering will continue to be another part of the science center toolkit, and other things will join them soon enough. Our museum has joined the world Maker movement, encouraging thinking about science with our hands. We initiated the first Mini Maker Faire in Israel; developed the Sand BricksBox, an outdoor exhibit for preschool children; presented thematic exhibits created by makers; and operated afterschool programs and family workshops. We have also led a group of European science museums, schools, and universities in developing and applying an innovative educational program, ENGINEER, using engineering design challenges for elementary schools. After two years, we are convinced that the maker approach, whether expressed in activities or environments, should be integrated in STEM education and become an important future direction for science centers. Making and tinkering spaces are here to stay. Maker experiences align with science centers’ core values of creating hands-on, interactive experiences with visitors. As science centers move from “nice to necessary,” making and tinkering spaces and activities provide real-world value, teaching visitors tool and materials literacy, providing a sense of satisfaction at completing a personally relevant project, and engaging visitors in using 21st-century skills. Making and tinkering spaces and activities lower the barriers of accessibility, allowing visitors to try machines, software, and tools not previously available or familiar. They invite safe exploration of the design process, including failure, iteration, and divergent outcomes. The real-world skills gained from making and tinkering contribute to college readiness and help fill the education to employment gap. For COSI, making and tinkering allow us to play a more significant role in our local innovation ecosystem, leading to more opportunities for partnerships, community events, and support of our science center. The science center experience depends on a carefully crafted environment that allows for limited, short-term experimentation focusing on a particular concept or natural phenomenon. The goal is to catalyze a sudden realization that will lead to further questions and investigations. A making or tinkering space encourages discovery through construction and manipulation of materials in a safe zone for more in-depth investigations. Making and tinkering spaces and science centers are a bad marriage. Making and tinkering spaces do not provide rapid entry into that special moment of concept realization—that “Aha!” moment. Science center experiences are engineered to inspire the visitor in an instant. Making and tinkering spaces provide for a more slowly developing understanding, one that can take varying times depending on the individual. Any making and tinkering spaces that have quicker outcomes are probably cookie-cutter experiences. I don’t know if making and tinkering spaces are here to stay, but if they are, science centers are definitely on their way out. Some are here to stay, and some aren’t. The ones that are created “because everyone is having one” and end up as glorified craft tables deserve to disappear. The ones that approach the topic seriously will persist. Science centers should be about empowering their audiences. We’ve always talked about being hands-on and getting visitors to do things for themselves, but actually, hands-on exhibits only allow this to the extent that we design it. Proper making and tinkering spaces create opportunities for visitors to explore scientific phenomena through their open-ended creativity and allow them to surprise us with the outcomes in ways conventional exhibits do not. If museums and science centers are serious about being hands-on places, they need to be serious about making—if they aren’t, they are probably didactic, top-down institutions at heart, just using interactivity as a garnish. We humans like to label things. By using terms like “making” and “tinkering,” I believe we may be limiting ourselves somewhat. Look at this from another direction, and I think we can better answer the fad-or-stay question. It appears to me that a deficit exists to which making and tinkering are potential solutions. Unstructured play-time is diminishing, fewer kids have access to basement workshops or tool benches in their garage (if they have a garage at all), and grandmothers who teach us to sew or knit are no longer the norm. I firmly believe that science centers are filling a void that hasn’t yet been fully understood. “Think with your hands” is more than an interesting aphorism; it is being recognized as a vital component of learning and brain development. Contrast this with our increasingly two-dimensional world, and I believe there is a huge role for science centers.